Zehra Naqvi is from Hong Kong. She and younger sister, Sophia, started GLO to meet a demand for graphic tshirts that was otherwise unsupplied in Hong Kong. Inspired by a research project she conducted over two months about colorism, Zehra noticed colorism throughout both of the places she calls home, Hong Kong and Pakistan. Finishing her junior year of high school, it was then that Zehra decided to use GLO as a platform for change. To use fashion to make a statement. On Columbia’s campus she’s involved in Columbia’s premier student-run hedge fund Lion Fund LLC acting as a Financial Analyst specializing in the Consumer & Retail Industry as well as being Director of Social Awareness at Delta Gamma Zeta Theta chapter, Advocacy Chair for Columbia’s Chapter of the UN’s Girl Up and works with the Dean’s Office to plan the 2019 - 2020 Core Centennial. She hopes to continue expanding GLO as CEO and see the brand empower new people as it grows. Sophia Naqvi is from Hong Kong, Singapore, and Pakistan. In 2014 along with Zehra, her older sister, she co-founded GLO initially to fill a niche in the market for trendy graphic tee’s in Hong Kong. In 2016, Sophia facilitated GLO in the shift from becoming a simple supplier of graphic t-shirts to a socially aware brand with the launch of the empowerment campaign. Besides working on GLO, Sophia is active in a variety of other extracurricular pursuits, including being executive director of TEDxYouth@HKIS since 2016, a student ambassador to her school, and a leader of the Citizens Foundation club. 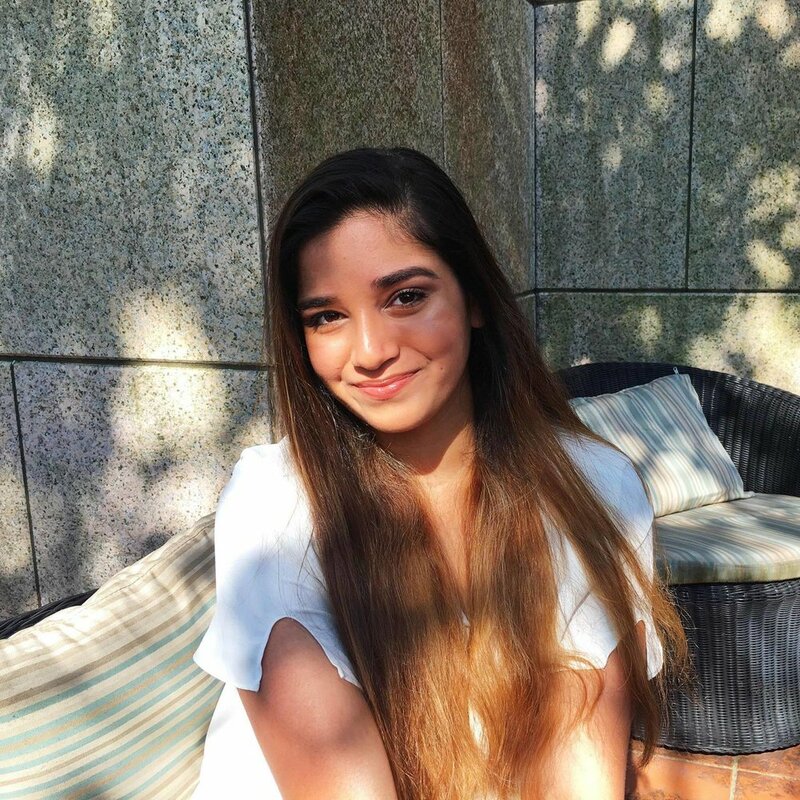 Outside of school, Sophia has pursued the study of culture, social inequalities, and history through independent research, as well as internships at Islamabad United, the Sprouts Foundation, and the Asia Art Archive. She is excited to see how GLO will further expand and empower individuals in the years to come. Gretta Kissell is from Tiffin, Ohio but now resides in NYC as a first year at Columbia University. In high school, she founded a chapter of the nonprofit organization Glamour Gals; she also served on Mike DeWine’s Teen Ambassador Board, collaborating with the Attorney General’s department to combat crises affecting Ohio adolescents. She has continued her passion for assisting disadvantaged youth in college while working for Columbia’s Office of Undergraduate Admissions as an Alma Mater Ambassador; she is also a consultant at JÜV Consulting. Gretta loves working with GLO to help highlight and empower women and people of color as they take the world by storm. Em Godshall was born in Guangzhou, China, but grew up in Philadelphia, PA. She is currently attending Columbia University as a Philosophy major. She’s passionate about the intersection of art and service work. In the past, she served as Head of Service Council, Co-President of a theatre troupe, and created a visual art exhibition that featured self-portraits which explored different aspects of her identity. At Columbia, she is involved with philanthropy groups and the Asian American Alliance. She loves working with GLO because she views it as an intersection of creative pursuits and social purpose.